Not even a day of thunderstorms could keep drum corps away from Allentown, Pa. on Friday, July 31 for day one of the DCI Eastern Classic. After an hour delay due to the weather, the show continued as normal and 11 World Class corps wowed the crowd in one of the last competitions before the DCI World Championships in Indianapolis. 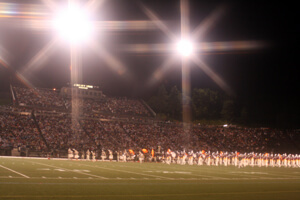 The iconic J. Birney Crum Stadium, host to more than 30 years of drum corps competitions, is heralded by fans as a mecca of marching music and is a favorite of corps members. "This is one of my favorite venues to perform in," said Pioneer baritone player Samuel Karafotis. "It has so much history to it, there's always a great crowd here, and it's like a drum corps home. There's something special, something magic about this stadium." One of the highlights for longtime Allentown drum corps fans was the reopening of the upper seating deck of the stadium, which was completely renovated after it had been closed for several years after falling into disrepair. George Roos, who has been coming to Allentown as a fan since the very first DCI competition held at J. Birney Crum Stadium on July 9, 1977, was among the throng of people once again enjoying the view from the upper deck. "It's an amazing vantage point. The biggest change is that the comfort of the seats is so much better. The old wood benches were splintered, but you dealt with it because it was the best place to see the shows," Roos said. "I would compare it to seeing a ballet. At the ballet you go to the top so you can see the entire stage. When you come to Allentown these are the best seats because you can see the entire corps … you can hear it and see it the best of any place in the entire stadium." The Blue Devils emerged victorious from the first night of competition at the DCI Eastern Classic, earning a score of 95.75. Fans in the stands saw a brand new ending to the Devils' show, featuring the melody of the George Gershwin staple "Rhapsody in Blue." Drum major Brian Howard said that while the performance was not perfect, it was exciting to debut the new ending. "It wasn't as clean as we would have liked—we have some things we need to fix. But it was exciting to show that ending to the fans for the first time," said Howard, who explained that the corps is focusing on their overall performance as World Championship Week draws perilously close. "We want to be able to get everyone on their feet at each impact in our show. We're working on performing the entire 11 and a half minutes and pushing it out to the last person in the audience." Taking second place in a narrow margin over the Cavaliers for the first time this season was the Holy Name Cadets, who earned a score of 94.30 and four standing ovations from the corps' hometown crowd. The Cavaliers were just two-tenths of a point behind in third place with a score of 94.10. "Our goal the whole season has been to get better and better each day," said Holy Name Cadets drum major Ben Pouncey. "These last couple weeks we've had the same discussion every morning to just go after it every day – get up in the morning, work as hard as possible, and the scores are what they are. That's been our mentality this entire time, and it's starting to work out for us." The Bluecoats (4th, 91.10) took a commanding lead over Glassmen (5th, 86.36), while sixth place went to the Troopers (83.80). Creeping up just one point behind was the Academy (7th, 82.80), followed by Mandarins (8th, 78.85), Pacific Crest (9th, 78.30), Pioneer (10th, 74.00) and Cascades (11th, 73.85). "Today was interesting because earlier we got to rehearse in the stadium, and that set us up for success because we knew how it would feel," said Glassmen euphonium player Kevin Brennan, who said he is excited to return to his hometown of Indianapolis next week for the World Championships. "We had a great show. The big hits were there and a lot of energy came off the field." At this point in the season, all eyes are on the World Championships. "We're working our tails off, trying to get everything clean and trying to make as few changes as we can so nothing is brand new, and making sure everything is solid and stays that way," said Pacific Crest drum major Zach Headden. "Every year at the World Championships I always look forward to the Individual & Ensemble Competition (I&E). Many of our members participate and our cymbal line always has the most fun performance. I&E is always a fun treat."